The 16-hour process of charging Discovery's pressure vessels for flight got underway at 3:10 p.m. EDT today following the completion of repairs and testing to the right-hand orbital maneuvering system engine pod. The hazardous work should be finished around dawn Sunday, with access to launch pad 39A expected to be restored at 7 a.m.
Countdown clocks are slated to start ticking Sunday at 2 p.m., leading to blastoff on Wednesday at 3:52 p.m. on Discovery's final spaceflight before retirement. NASA's next planned news briefing comes Sunday at 10 a.m. EDT. We'll stream it live. NASA managers decided Saturday to delay the shuttle Discovery's launch an additional day to Wednesday to give engineers enough time to complete replacement and retest of leaky quick-disconnect fittings in the ship's right-side orbital maneuvering system rocket pod. "The plan as we knew it yesterday was to vent down our tank and remove and replace some parts that we thought were faulty on an air half coupling on our righthand OMS maneuvering system pod and then do some leak checks. As we went through the day yesterday we learned that there was some additional work that we needed to do, as sometimes when you get into the job you get a little bit smarter and we did....and there's quite a bit more work it turned out that we needed to do from a leak check perspective and some of the venting operations that needed to be done. "As a result of that, we're a little bit down on our timelines that we briefed yesterday and so the ability for us to get into call-to-stations today for launch countdown is no longer available to us. "So our plan today is to go ahead and continue that work that we need to do on the repair and then getting back into flight configuration on the OMS pod. Right now, we're going to target a call-to-stations for tomorrow, for Sunday, at 1:30 in the afternoon, which would move our launch date out an additional day to Wednesday, the 3rd. "Some of the things we learned as we went along yesterday that changed our plan -- we planned on venting down the tank and as part of that operation there's some additional venting that had to be completed that required some configuration of valving that we needed to actually get in and remove a door and a panel and change the configuration on some of our valving. So as a result of that and some additional leak checks, some intermediate ones and some intermediate pressurizations that hadn't accounted for in our preliminary plans, that just essentially drove our timelines out. "That work is all done and behind us, and the preliminary leak checks look good, but we do have some additional ones once we get up to flight pressure, which will give us further confidence that we've got a good repair. "Right now, we're in the process of doing a pressurization. This is an initial pressurization of the tanks. It's called a cheat load, and as part of that we'll bring the pressure up and do some additional leak checks. This is something we hadn't accounted for yesterday when I was speaking with you. Normally when we are in configuration to go do our final press to flight mass we are at a higher pressure than we were as a result of this repair. Since we vented the tanks all the way down to ambient, we have to come back in and now we have to get them up to an intermediate pressure before we can go and pressurize again to our flight mass. So that's what we are doing this morning, and that just started and will take several hours to get us into the early afternoon hours. "At that point, we've got a couple of lines we need to reconnect and then go ahead and start the rest of our operation, which is the 16-hour portion of the pressurization to flight mass. We'll get into that hopefully later this afternoon or early evening, and that will take us through tomorrow morning and get us in good shape to pick up the countdown tomorrow afternoon." DELAY. Shuttle managers have decided to push back Discovery's launch an additional 24 hours, enabling technicians time to complete testing and the pressurization of Discovery's helium system before starting the countdown sequence. Liftoff has been rescheduled for Wednesday at 3:52 p.m. EDT (1752 GMT). The three-day countdown now begins Sunday at 2 p.m. EDT. Loading of the cryogenic reactants into Discovery's electricity-generating fuel cell occurs on Monday afternoon. Retraction of the pad 39A mobile service gantry happens Tuesday night at 7 p.m. Launch day activities include fueling of the external tank starting at 6:27 a.m., the astronauts donning their spacesuits around 11:30 a.m. and the crew departing quarters at 12:07 p.m. The precise launch time aims for the moment when Earth's rotation carries pad 39A into alignment with the International Space Station's orbital plane. That happens at 3:52:13 p.m. EDT. The day's available launch opportunity overall extends from 3:47:13 to 4:00:27 p.m. EDT. Weather forecasters predict a 70 percent chance of acceptable conditions for a Wednesday launch of the space shuttle. The suspect coupling hardware on both the shuttle- and ground-sides was removed and replaced overnight, engineers say, as the leak repair work continues on Discovery at pad 39A. Checks of the new hardware are underway. The 16-hour repressurization of the orbiter's helium system will begin later today. Officials will convene an 8 a.m. EDT meeting to review the progress of work and decide if Discovery's countdown can start at 2 p.m. EDT today or if launch needs to be pushed back an additional 24 hours. The status news briefing remains scheduled for 10 a.m. EDT. NASA plans news briefing Saturday morning at 10 a.m. EDT to update shuttle Discovery's status. We'll stream it live right here on this page. Managers met Friday afternoon to assess the game plan to fix the helium leak, retest the system and then get Discovery back into a launch posture. Technicians will be working throughout the night at pad 39A. Officials will review the timelines in the morning to determine the viability of starting the countdown at 2 p.m. EDT. The shuttle Discovery's launch on a space station resupply mission is being delayed from Monday to at least Tuesday -- election day in the United States -- to give engineers time to repair two leaking quick-disconnect fittings in pressurization systems used by the ship's right-side orbital maneuvering system rocket pod. Space shuttle workers will replace the connectors between Discovery's right-hand orbital maneuvering engine pod and ground equipment to resolve a helium leak. The shuttle's pressure reservoirs have to be safed before the repairs, however, and the subsequent work to repressurize the systems means there's simply not enough time to complete the efforts and still launch on Monday. That forced NASA earlier today to delay Discovery's launch by 24 hours. "Our forward plan at this point is to change out both the flight side and the ground side of those couplings, and we're going to work on that throughout the day. We've already been putting plans in place this morning to do that. "As a result of when we did our pressurization last night to our flight mass on the orbital maneuvering system, we're going to have to vent those tanks back down again in order to do those repairs and the removal-and-replacement of those couplings, and then as we go back in throughout the day we'll have to do some additional leak checks and make sure those things are ready to fly again before we hook them back up together and pressurize to our flight mass again. "The big part of that whole process is the actual repressurization of those tanks, which is about two shifts or nearly 16 hours of work. The actual repairs and removal-and-replacement of those parts isn't very complicated and we've done it in the past. These types of couplings, we have had issues with different ones in the past and so it's fairly common when we have to go off and do these (repairs) and it's a well known process and the folks do a really good job at that. "That's kind of the thing that's driving us, is the need to depressurize our tanks and then repressurize those. That repressurization of the tanks requires a pad clear, which precludes us from doing the normal things that we would do during a launch countdown. So as that goes throughout the day, we would not be able to pick up the launch countdown this afternoon if we had our pad cleared doing the rest of those operations during the repressurization of those tanks. So that's why we made the decision to push off 24 hours for the start of the countdown and subsequently the launch date as well." There was a nitrogen system leak too. But Spaulding said it is minor and can be resolved without impact. The weather outlook for Tuesday's launch calls for a 70 percent chance of acceptable conditions. The concerns include the chance of low clouds and showers within the restricted area around the emergency runway at the Florida spaceport. At the 4:17 p.m. EDT launch time, the forecast includes scattered clouds at 3,000 and 7,000 feet, good visibility, a slight chance of showers, southeasterly winds of 10 to 15 knots and a temperature of 78 degrees F.
For the backup launch opportunities on Wednesday and Thursday, the odds of acceptable weather remain at 70 percent. NASA managers decided early Friday to delay launch of the shuttle Discovery from Monday to at least Tuesday -- election day in the United States -- because of work to fix two leaks, one helium and one nitrogen, in the plumbing of the orbiter's right-side orbital maneuvering system rocket pod. If Discovery is able to launch Tuesday, here's a look at the new times for the mission. The target liftoff time is precisely 4:17:56 p.m. EDT. The day's overall 10-minute launch window runs from 4:12:56 to 4:22:56 p.m. See the available launch windows. The space shuttle will be inserted into a 124 by 85 nautical mile orbit to begin its pursuit of the space station. Docking is now targeted for November 4 at 12:10 p.m. EDT. Mission duration is planned to be 10 days, 18 hours and 48 minutes, leading to landing at Kennedy Space Center on November 13 at 11:08 a.m. EDT. DELAY. 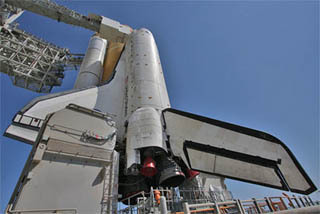 Launch of space shuttle Discovery has been delayed one day to repair the leaks. The countdown sequence will begin at 2 p.m. EDT on Saturday, leading to blastoff on Tuesday at 4:17 p.m. EDT. NASA plans a status briefing at 10 a.m. EDT and we'll stream it live. Engineers are troubleshooting two leaks, one helium and one nitrogen, in the plumbing of the shuttle Discovery's right-side orbital maneuvering system rocket pod. It is not yet known what impact, if any, the two leaks might have on today's planned start of the countdown or Monday's scheduled launch. Helium and nitrogen leaks were encountered on space shuttle Discovery last night when technicians were pressurizing the orbiter's main propulsion and orbital maneuvering systems. NASA is working to understand the two leaks and determine how to resolve the problems. This situation has the potential to postpone the launch of Discovery. But no delay has occurred yet and the countdown remains scheduled to begin ticking at 3 p.m. EDT today. The six-member all-veteran crew of the shuttle Discovery flew to Florida Thursday to await the start of their countdown Friday and blastoff Monday on a space station resupply mission. Six astronauts traveled from their home base in Houston to the Kennedy Space Center launch site in sleek T-38 jets Thursday afternoon, trained and ready to take shuttle Discovery for its final spaceflight. Commander Steve Lindsey, pilot Eric Boe and mission specialists Al Drew, Tim Kopra, Nicole Stott and Mike Barratt arrived at the Florida spaceport to begin counting down to Monday's blastoff. "We got to fly over top of the orbiter and it looks like it's a beautiful orbiter ready to go, and the weather looks like it's going to be ready Monday as well. So I think we're all set to go," said Drew. "I wanted to say a word of thanks to the team down here at the Kennedy Space Center. As you know, they had an OMS crossfeed leak going on. They actually stopped the leak but decided to replace everything anyway. I think they changed out those seals in record time, did a good leak check and did a fantastic job getting the vehicle ready, 100 percent ready to go, and still getting us ready for a November 1 launch," Lindsey said. The crew will head to sleep at 10 p.m. EDT, then be awakened at 6 a.m. Friday for Lindsey and Boe to fly landing approaches into KSC's runway using Shuttle Training Aircraft. The entire crew will spend time later in the day reviewing the flight data files and checking their launch and entry spacesuits. Discovery's three-day launch countdown sequence begins Friday at 3 p.m. EDT. All activities remain on schedule for Monday's 4:40 p.m. EDT launch time. Out at pad 39A, the orbiter's aft engine compartment has been sealed for flight and pressurization of the shuttle's propulsion systems will get underway tonight. Welcome to the spaceport! All six Discovery astronauts have arrived for launch. Al Drew should be landing in a few minutes. The full crew will re-assemble at the runway for their ceremonial arrival event and speech. Three of the four T-38s jets have reached the Kennedy Space Center for Monday's launch of the space shuttle Discovery. Five of the six astronauts have arrived, with Al Drew expected to get here in a little while. Mission specialist Tim Kopra just landed in the T-38 being flown by former shuttle skipper Lee Archambault. On hand to greet the arriving astronauts are KSC director Bob Cabana and shuttle launch director Mike Leinbach. Commander Steve Lindsey and mission specialist Nicole Stott have arrived in their T-38. The jets are arriving here at the Kennedy Space Center's Shuttle Landing Facility, which is the same three-mile-long concrete field where Discovery will touch down to conclude the upcoming mission. The T-38s are buzzing over the runway, headed for a flyby of shuttle Discovery at launch pad 39A before landing. The shuttle Discovery astronauts are en route from Ellington Field near the Johnson Space Center in Houston on the trip over to the Kennedy Space Center in Florida. Their arrival is now expected by 3 p.m. EDT. Space shuttle Discovery is being buttoned up for launch. Technicians have installed the doors on the solid rocket booster forward access compartments and closeouts of the orbiter's aft compartment will be finished by early Thursday when those flight doors are shut. And the spacewalking suits for the mission were delivered and packed aboard Discovery on Tuesday. The astronauts went into pre-flight quarantine on Monday. They've completed a final session in the launch simulator to run through procedures and practice dealing with problems. Arrival at Kennedy Space Center is now expected Thursday between 2:45 and 3:45 p.m. EDT. Launch of Discovery remains on schedule for next Monday. The official target launch time has shifted a second to 4:40:27 p.m. EDT. That's when Discovery's launch pad and the International Space Station's orbital plane are properly aligned. The change comes after the recent debris avoidance maneuver the station performed that changed its orbit. The day's overall 10-minute launch window runs from 4:35:27 to 4:45:27 p.m. See the available launch windows. The space shuttle will be inserted into a 124 by 85 nautical mile orbit to begin its pursuit of the space station. Docking is now targeted for November 3 at 1:17 p.m. EDT. Mission duration is planned to be 10 days, 19 hours and 2 minutes, leading to landing at Kennedy Space Center on November 12 at 10:42 a.m. EDT. See the full flight plan. Space shuttle technicians are scurrying around launch pad 39A this evening to connect ordnance as pre-flight preparations continue for Discovery's blastoff next Monday. Our live streaming video shows workers inside the access compartment atop the left-hand solid rocket booster and others on the catwalk that extends to the external tank gaseous hydrogen umbilical arm. "We're in great shape out at the pad. We've used up our four days of contingency for that leak repair, but we're right on schedule now. We'll get into our ordnance installation tonight, which we had to delay becase of the work in the aft of the orbiter. We'll do the main propulsion system and hypergolics system pressurizations on Thursday night, and throughout this week we'll be closing out the aft of the orbiter, that's in work right now. I see no reason right now at all that we can't get into the launch countdown per plan on Friday afternoon," says Mike Leinbach, shuttle launch director. "We've done all of our training. We did extra training over the summer to make sure that the launch team and the flight control teams were up to speed and ready for this mission. Actually, did quite a bit of extra training in the down time this summer. So I feel good about the team, I feel good about getting to launch countdown on Friday and having a liftoff on the first attempt next Monday." After reviewing normal processing and weekend work to fix a small fuel leak, NASA managers Monday cleared the shuttle Discovery for an election-eve launch Nov. 1 to begin a space station resupply mission, the orbiter's 39th and final flight. The post-FRR news briefing from the Kennedy Space Center is scheduled for 4 p.m. EDT. You can watch right here in our streaming coverage coverage of STS-133. The official target launch time on November 1 has shifted a few seconds to 4:40:26 p.m. EDT. That's when Discovery's launch pad and the International Space Station's orbital plane are properly aligned. The day's overall 10-minute launch window runs from 4:35:26 to 4:45:26 p.m. The space shuttle will be inserted into a 124 by 85 nautical mile orbit to begin its pursuit of the space station. Docking is now targeted for November 3 at 1:18 p.m. EDT. Today's Flight Readiness Review has concluded with a unanimous "go" for launch of Discovery next Monday at 4:40 p.m. EDT. Senior managers reviewed the readiness of the space shuttle and International Space Station for the mission to deliver the Permanent Multipurpose Module and another spare parts pallet. A news conference with NASA officials is expected at 4 p.m. EDT today. The solid rocket boosters and external fuel tank have been reviewed for Discovery's mission. The team is pausing for lunch before delving into the orbiter. Meanwhile, the Progress 37P cargo freighter, now packed with trash, has undocked from the International Space Station. That clears the way for launch of the next resupply ship this week from the Baikonur Cosmodrome in Kazakhstan. The morning session of the Flight Readiness Review received briefings from the mission operations folks who will run STS-133 from Houston and discussed the status of life-support elements aboard the space station. After a break, managers are moving into the review of space shuttle topics. The Flight Readiness Review is underway today at the Kennedy Space Center. Senior officials are examining all aspects of mission preparations to ensure space shuttle Discovery, its astronauts and payloads are ready to go fly the STS-133 mission, as well as the International Space Station is ready to receive this latest construction flight. The meeting will culminate with managers setting the formal launch date. The shuttle is targeting blastoff a week from today. NASA plans to hold a post-FRR news conference this afternoon. The exact start time has not been determined. We'll post updates on this page and dispatch Twitter alerts as further details become available. The flight load of monomethyl hydrazine has been put aboard Discovery again for maneuvering the space shuttle during its mission. The fuel had been removed so technicians could replace a pair of flange seals on Saturday night. With that leak repair work completed, Discovery is getting back into the pre-launch preparation sequence again. Ordnance connections will be made starting Monday. Also upcoming Monday is the senior-level Flight Readiness Review to assess the status of work and affirm plans to launch the shuttle on November 1. NASA will hold a news conference once the FRR ends. The exact start time for the afternoon briefing will be determined once the meeting concludes. We'll provide updates here and stream the event live. The astronauts are scheduled to arrive at Kennedy Space Center on Thursday afternoon and the launch countdown begins on Friday afternoon. Working through the weekend, engineers drained toxic propellants from the shuttle Discovery's orbital maneuvering system rocket pods, dried out the lines, disassembled a fuel-line flange Saturday and replaced two internal seals in a bid to stop an on-again, off-again leak. With the crossfeed line deemed ready for opening, technicians are spending this evening replacing two internal seals to restore the system into a good condition. A tiny fuel seepage was detected from the flange area and the leak eventually stopped during subsequent testing. But NASA ordered the seals be replaced to ensure no problems would occur during Discovery's flight. Discovery's hypergolic fuel has been drained from the space shuttle to enable technicians to make repairs on the tiny seepage detected around a flange. The monomethyl hydrazine offload began Thursday night and finished before dawn this morning. A drying process for the plumbing will be performed before the flange between the right-hand orbital maneuvering system pod and Discovery can be demated. Primary and secondary seals in that interface will be replaced this weekend to stop the leak once and for all. The leak rate was one drop every six minutes, according to a NASA spokesperson. Plans call for the work to be completed over the next couple of days and then Discovery's maneuvering fuel can be reloaded for launch. If all goes well, the repair work won't delay Discovery's scheduled November 1 liftoff date. Engineers geared up Thursday to drain toxic rocket fuel from the shuttle Discovery's orbital maneuvering system rocket pods before beginning weekend work to replace suspect seals in a fuel-line flange to fix an on-again off-again leak. Engineers say the schedule is tight, but they believe they can complete repairs in time for Discovery's planned Nov. 1 launch on a space station resupply mission. Uncomfortable with an on-again, off-again leak in the plumbing used by the shuttle Discovery's maneuvering rockets, NASA managers Tuesday ordered engineers to forego additional testing and to press ahead instead with work to replace internal seals in a fuel line fitting. A small fuel leak in the plumbing used by the shuttle Discovery's maneuvering rockets apparently stopped during work overnight to double-check the torque on six bolts in a suspect flange. There were no obvious problems with the bolts and it's possible increased pressure in the line may have helped seat internal seals. Engineers troubleshooting a small fuel leak aboard the shuttle Discovery decided Monday to carry out additional tests before more invasive and time-consuming work to replace a suspect seal, officials said. Engineers are troubleshooting a small fuel leak aboard the shuttle Discovery that will require them to interrupt launch processing and drain toxic propellants from the ship's aft rocket pods before beginning repair work later this week. Shuttle Discovery's 60-foot-long payload bay doors on Saturday swung shut and were latched for launch. The next time the doors are opened will be about 90 minutes into the mission on November 1. The Permanent Multipurpose Module and the Express Logistics Carrier No. 4 had been loaded into the payload bay last week. A series of interface verification tests between the cargos and the orbiter occurred successfully. And the astronauts paid a visit Friday afternoon to inspect the payloads. The crew returned to Houston after their payload bay tour. The crew has some final training to finish at the Johnson Space Center before going into pre-flight quarantine. They are scheduled to arrive back at KSC around 2:30 p.m. EDT on October 28 to start launch countdown preps. Meanwhile, pad technicians have isolated a tiny hydrazine leak in the crossfeed flange on one of Discovery's orbital maneuvering system engine pods. Plans are being developed for a mid-week draining of hydrazine fuel to inspect the flange's interface and seals. Simple repairs are possible at the launch pad without delaying the November 1 launch date.